Bomb the Giraf is a game containing asymmetric gameplay where a team of 3 must protect a giraffe from the bomber and get it to safty. For an optimal play session, 4 players should be involved. Each player has one role in the gameplay. The Watcher is the player who is allowed to watch the screen and whose mission is to guide his team to freedom and avoid the mines and bombs. 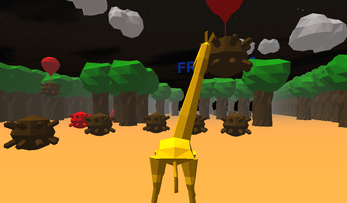 The Walker controls the movement of the giraffe. She must follow the instructions watcher to get through the world. The walker moves using the left analogstick on the 360 controller. The Bender controls the bending of the giraffe neck as to avoid the floating bomb by dodging it at the right time. The Bender moves using the Right analogstick on the 360 controller. Access to an Xbox 360 controller, keyboard and screen is mandatory for gameplay.